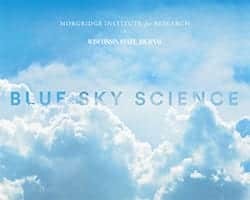 News & Stories > Blue Sky Science > How are cells created? There are two major tasks that have to happen every cell cycle. First, cells have to make an exact copy of their DNA. DNA is like the instruction manual for a cell. It encodes genes for characteristics and dictates things like eye color and blood type. DNA is organized into chromosomes. Most bacteria have one circular chromosome, while animal cells—including human cells—have multiple linear chromosomes. These chromosomes get replicated during the synthesis phase, or S phase, of the cell cycle. The second major task of every cell cycle is for the replicated chromosomes to be organized and separated into opposite sides of the cell. This happens during mitosis, or M phase of the cell cycle. During mitosis, cells build a molecular machine, which is known as the mitotic spindle. The mitotic spindle is composed of filaments, called microtubules, that grow and shrink. The microtubules connect to the chromosomes and organize them in such a way that they all line up in the middle of the cell. After the chromosomes line up in the middle of the cell, they then separate to opposite sides, still connected to the microtubules. The cell then grows longer, further separating those masses of chromosomes. The middle of the cell then pinches off in a process known as cytokinesis, splitting the cell into two cells. A new cell has been created and that completes the cell cycle.